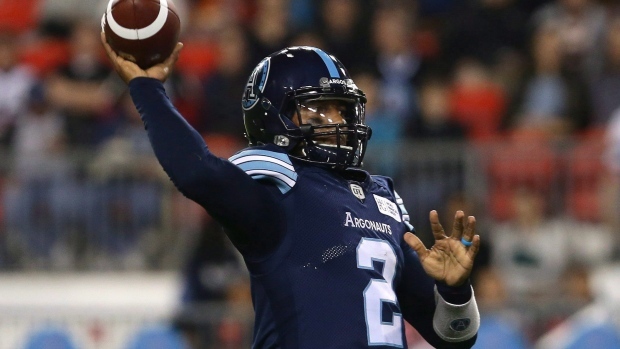 The Toronto Argonauts will turn to James Franklin at quarterback when they take on the Hamilton Tiger-Cats on Friday night at BMO Field, head coach Marc Trestman confirmed on Tuesday. The 27-year-old took first team reps at practice on Tuesday. Franklin replaced McLeod Bethel-Thompson in the team's 26-23 loss to the BC Lions on Saturday, finishing 9-14 for 103 yards and two touchdowns. Trestman was complimentary of Franklin's play after the game and indicated he could consider starting him next week. In eight games for the Argonauts this season, the 27-year-old Franklin is 102-156 for 1,073 yards and five touchdowns to six interceptions. He also has 203 yards and 12 touchdowns on 55 carries through 14 games for the Argos. Bethel-Thompson has gone 184-281 for 2,007 yards and nine touchdowns to nine interceptions.